Emotional support animals have been making a lot of travel news lately. From the woman who got pissed off at United Airlines for not allowing her emotional support Peacock on her flight to Spirit Airlines allegedly suggesting a woman flush her emotional support hamster Pebbles down a toilet….WHICH SHE DID!!! (I wish I was making these things up, I really do). Just to be clear, I am cool with highly trained service animals on flights, but the other ones are a little beyond me. Not saying that in some cases the need for emotional support is not necessary, but I am saying it can be hard for me to wrap my head around using exotic animals like peacocks for this purpose. However the Popeye’s Chicken in the Philadelphia International Airport understands traveler’s main emotion: Hunger. That’s right, to me, my toddler and many other weary travelers, both ‘hunger’ and ‘hangry’ are legitimate emotions. With travelers like us in mind and a creative marketing team at their disposal, Popeye’s has created the necessary companion for every hungry traveler passing through the ‘City of Brotherly Love’: The Popeye’s Emotional Support Chicken! “Popeye’s decided to offer its own version of ’emotional support animals pushing the envelope’ by offering travelers ‘Emotional Support Chicken’ — a gesture designed to bring holiday travelers some needed humor to what is one of the most stressful places to be during the holidays — the airport,” the chain said in a press release. 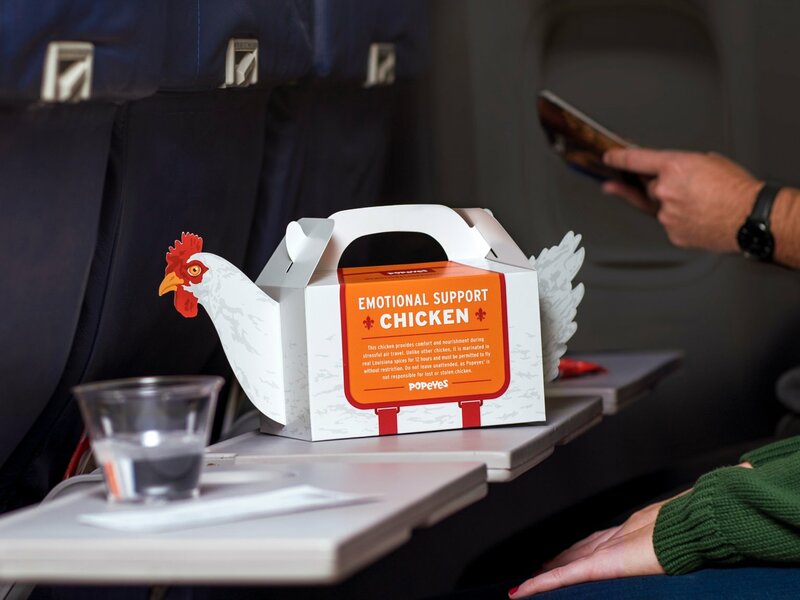 The Popeye’s Emotional Support Chicken comes with a 3-piece chicken tender combo meal, a useful carrying handle and no need to cluck or urinate during the flight. As anyone familiar with Popeye’s meals will tell you however, the consumer may wish to be seated close to the bathroom. Interesting! I wouldn’t have thought of a peacock as an emotional support animal. Their packaging is clever. Aha! I love this idea it’s so great! I really want an empty emotional support chicken box for myself to keep up on a shelf somewhere to stare at it when I feel the need.